Back in 2003 the propaganda drum-beats for the invasion of Iraq had begun and the "patriots" on one of my favorite chat sites were publicly salivating at the possibilities of "turning the sand to glass". I argued so vehemently against this vanity war that I was eventually banned. After a few hundred of these posts were in place I went to the server, deleted the flower image, and replaced it, filename and all, with a 10-meg high-rez image. For those not familiar with the state of connection speed in 2003 this action was akin to every 18-wheeler locking-up their brakes on the freeway... at rush hour. Petty? Yes. Satisfying? Oh, yeah. Would I do it again? Well, let's just see which country Trump decides to nuke first. I'm selling a rather bulky piece of technology on Craigslist and an interested party asked if I could demo it for him at a local Starbucks. I responded that I wasn't lugging it anywhere, that if he wanted to see it in operation he had to come to my house. He said no because, basically, he said he was afraid. I understood what he meant, and I felt sorry for him. He'd fallen for the media-driven paranoia that crime is everywhere and we're all its next victim. The guy had my name, my phone number and my address. Hardly the sort of thing a person intending to commit a crime would provide. I learned a long time ago to not argue with people like this so I told him to have a good life. The world is still full of brave suckers. 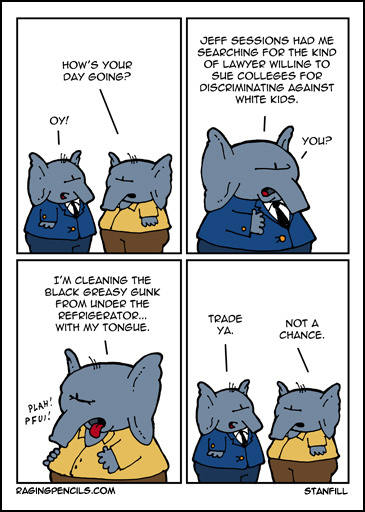 GOP elephants: How's your day going? Jeff Sessions has me searching for the kind of lawyer willing to sue colleges for discriminating against white kids. You? I'm cleaning the black greasy gunk from under my refrigerator with my tongue.